July 9 I’m hiking on a gravel bar this morning. A lone, gray animal is trotting along the aufeis towards me. A wolf! I quickly sit down, mostly out of sight, and watch him trot my way. He’s lean, and acting like he knows where he’s going. If he’s hunting, he’s hunting with his nose. He drops down from the aufeis and trots across stunted willows and back up onto the ice. The wind is favorable so he doesn’t smell me. He passes without seeing me. What a fun way to start the day! 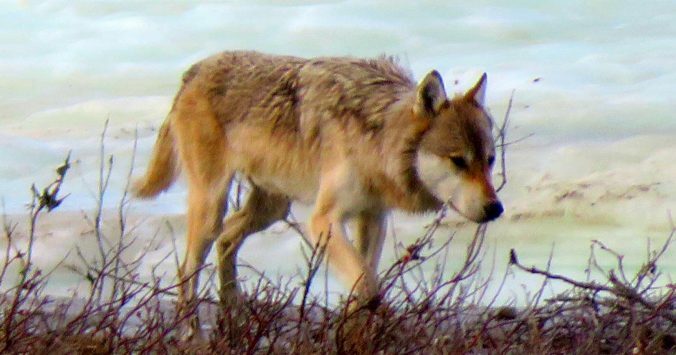 I follow the wolf’s route in reverse, seeing his muddy footprints on the ice. I wade the stream and hike on gravel and across ice and through the willows. I can cut off a mile or two of hiking by bee-lining crosscountry, around the end of the last ridge, to the main fork of the Coleen. My GPS shows me what peak to aim for. 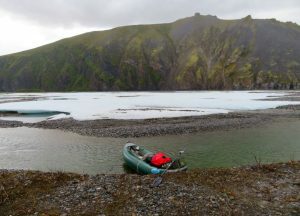 I leave the wide creek bottom and climb up onto a broad expanse of tundra, heading towards the landmark peak ahead. After a half mile I’m reconsidering the wisdom of my shortcut. It’s classic Alaska tussock walking: wet, spongy, uneven; slow and tiring ground. After an exhausting couple of hours I can see the wide riverbed of the main Coleen ahead of me. It’s a tremendous relief to finally walk out onto the wide gravel bar. My air taxi has given me coordinates, and a description of the cache site: “It’s right across from a big hole in the rock.” Soon I spot something ahead. Sure enough, it’s my cache. Yes! I look up on the ridgeline and see it, on the highest part of the ridge, sky peeking through a hole in the bare rock. [Barely visible if you enlarge the above photo.] Wilderness caches are fraught with the risk of miscommunication and fiasco so I’m very relieved to find my cache here and undisturbed. My inflatable kayak is in the 30 gallon drum. 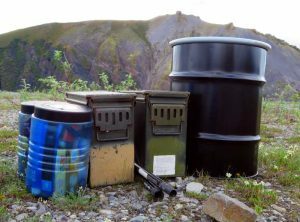 Much of my food is in two bear canisters, and the rest of my food and miscellaneous small gear is in two steel 20mm cannon shell boxes. Only with my paddle did I have to rely on a bit of luck. Bears love to chew on stuff but my paddle is unharmed. The cache must have been dropped off on a warm, sunny day, because on this cool morning there is so much suction on the drum lid that it’s a struggle, until I hear the hissing of air rushing in and it finally opens. Sorting through my food cache I feel like I’ve walked into a grocery store. There’s a variety of new treats that I snack on as I repack. I carefully inventory my supplies. I sort out a few things that I will leave. Inside the drum I put my pack, one of my hiking poles, my rain pants (I will be wearing Gore-tex waders from here on out) a rain jacket, (I’m swapping out an ultralight hiking jacket for a full featured rain parka,) my Ursack (I now have the bear canisters) one of the green ammo cans and all the trash I can find. This empty cache will be flown out in a few days when my air taxi flies through the area. The river is several hundred yards away. There’s an open channel, but man, it’s running through a lot of ice. I hope I don’t end up portaging for miles! Before picking up the last load I make sure I’ve left nothing around the cache, then head back to the river and inflate my kayak. It’s a twelve foot model, wide and stable. It takes just minutes to inflate it with the little pump. Rain showers are passing through as I strategize on how best to pack my boat. I put the dry bag right behind my back to lean against, with the bear canisters on the floor between it and the stern, and the ammo can tied down solidly on top. I check around to make sure everything is on board and secure and launch out into the current. I’m paddling the Coleen River! It’s fun to be on the water, paddling around corners, often scraping the river bottom, getting out and dragging when it gets too shallow. It’s raining off and on but in my good rain jacket and waders it doesn’t really matter. There’s a bit of a headwind but a decent current. I must be making about four river miles an hour. Sweet! What an easy way to make miles, even jumping out of the boat to drag now and then. Cottonwoods appear here and there. Late in the afternoon, what’s this? Two tents. And two rafts. I drift past, watching. No one is around. Or they’re sleeping. No matter, I don’t want to see anyone anyway. It’s raining hard when I decide to call it a day. 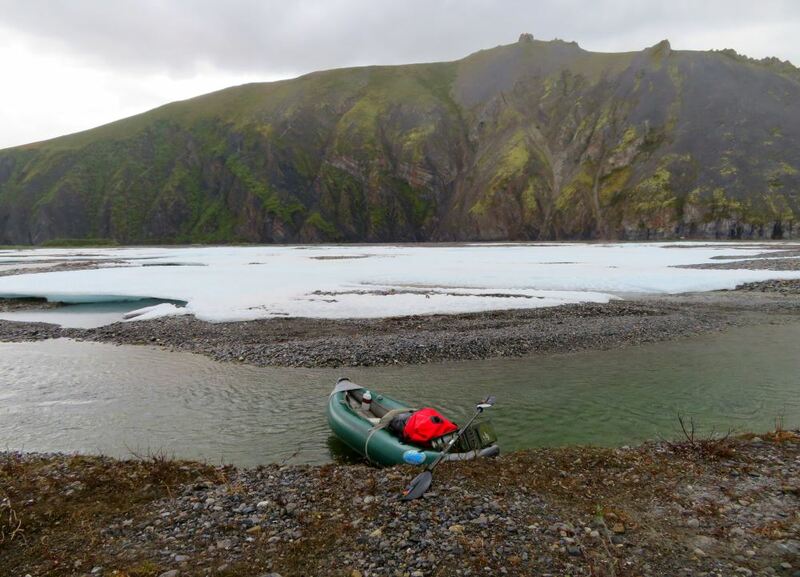 I land and unload the heaviest stuff, then pull my kayak out of the water and tie it off to some willows. Tying off a boat is a good habit. Rivers rise unexpectedly. Wind gusts can flip an empty boat into the water. I set up my tent as fast as possible and leave my sleeping bag and dry clothes in their trash compactor bag until they are under the vestibule. It’s nice to crawl into my tent, out of the rain. I must have paddled fifteen miles or so since launching at 2 PM. It’s fun to have completed the hiking part of the trip. To have hiked from the Arctic Ocean, over the Brooks Range. It’s a relief to have retrieved my cache with no glitches. It’s been a fine adventure. Great read. Another interesting segment. Feel like I’m reliving exploits vicariously through your words. Thanks for posting, Buck!